I can hear you saying that it's disgusting and you would never be interested in eating bugs. I guess you mean land based bugs, because you've probably eaten your fair share of marine based bugs such as lobster, crab, shrimp, crawfish (which are called "mud bugs" by Louisiana natives) and snails. And those are just the "bugs" that you know about. 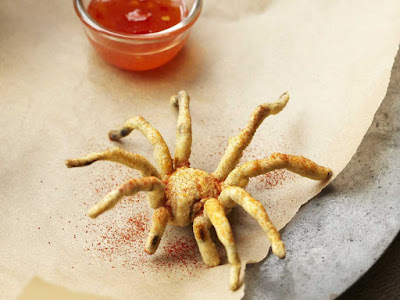 The US government has officially sanctioned entomophagy! The US Food and Drug Administration has established permissible degrees of insect damage and infestation (eggs, parts and immature and adult insects) that are allowed for various foods. The Department of Health & Human Services has set a standard called Food Defect Action Levels which "are set on the basis of no hazard to health...These levels are set because it is not possible and never has been possible to grow in open fields, harvest and process crops that are totally free of natural defects...The alternative to establishing natural defect levels in some foods would be to insist on increased utilization of chemical substances to control insects, rodents and other natural contaminants. The alternative is not satisfactory because of the very real danger of exposing consumers to potential hazards from residues of these chemicals, as opposed to the aesthetically unpleasant but harmless natural and unavoidable defects." There are several advantages to eating insects. They are a good source of protein and the nutritional value is equal, if not better, than traditional meat choices. Insects are abundant and easier to raise than cattle. There aren't the waste by-products (such as with pigs) that can contaminate the water system. Almost all parts of the world except Europe and North America enjoy insect delicacies. 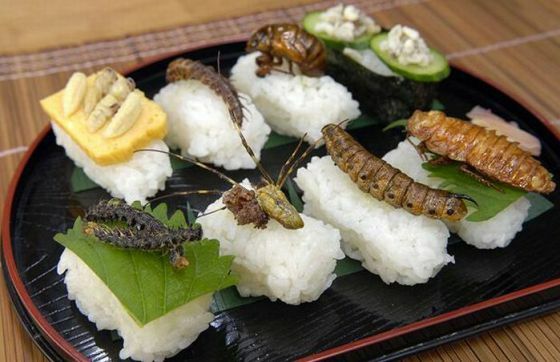 In Japan, you can find restaurants where such dishes as hachi-no-ko (boiled wasp larvae), zaza-mushi (aquatic insect larvae) and inago (fried rice-field grasshoppers) are offered on the menu. 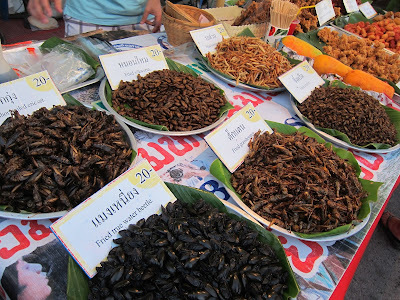 Sangi is fried silk moth pupae which are the by-products of the silk industry. These larvae are raised en masse for their ability to produce silk. Once they pupate, they can no longer produce silk and are used as food. In the states of Oaxaca, Guerrero, Morelos and Veracruz, Mexico, a salsa is made with "jumiles" and other species of stinkbugs. The flavor has been compared to mint and cinnamon. Other insects are eaten live with tacos. In Bali, the dragonfly is grilled or boiled with ginger, garlic, shallots, chili pepper and coconut milk. There are several books which give recipes and preparation techniques for a variety of insects. Maybe you prefer ethnic cuisine? I have links to a variety of online sources for Thai, Laotian as well as good ole American classics (anyone for Chocolate Chirpie Chip Cookies?). There are some things you should be aware of. Not all bugs are edible. 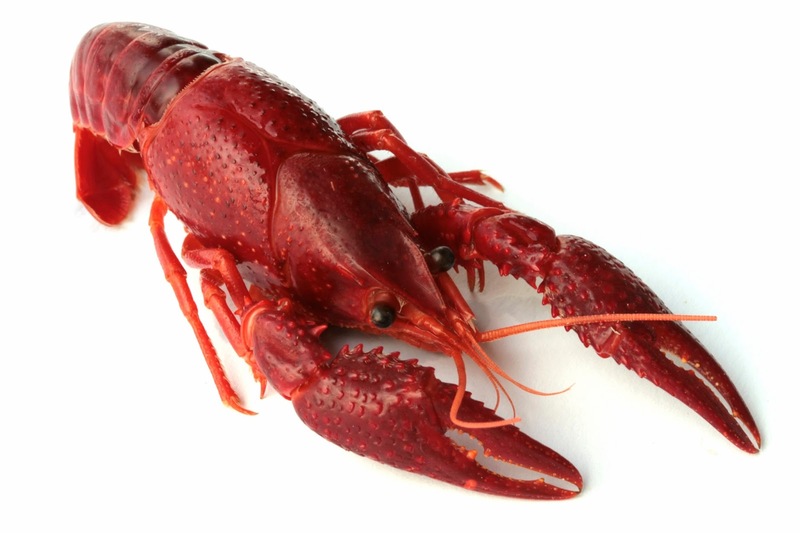 A simple rule is "Red, orange or yellow - forego this fellow. Black, green or brown - go ahead and toss him down." Grasshoppers are one insect that should not be eatern uncooked, as it carries several parasitic worms that can be passed to humans (but so does pork and fish). Also, a small percentage of people will have allergic reactions. If you are allergic to bee venom, it would not be wise to ingest bees. Typical allergic symptoms range from runny nose or rash to breathing difficulties or shock. 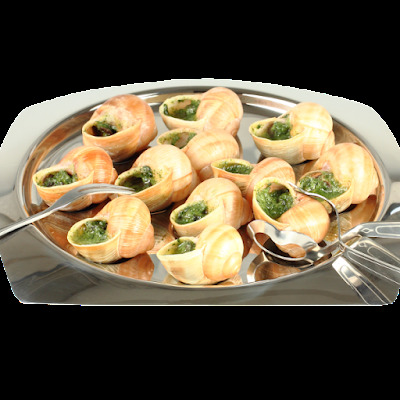 If you feel you are having an allergic reaction to a buggy meal (or any meal for that matter! ), get medical attention quickly. Where can you get insects? In my local museum of science (in Ft. Lauderdale, Florida), small packets of ants are sold in BBQ and Spicy varieties. You might occasionally find chocolate covered ants in gourmet stores. There are several sources for farm raised insects for both human and animal consumption. If you have any questions, please feel free to bug me.